Mosaics Dance Company - Please Join Us! 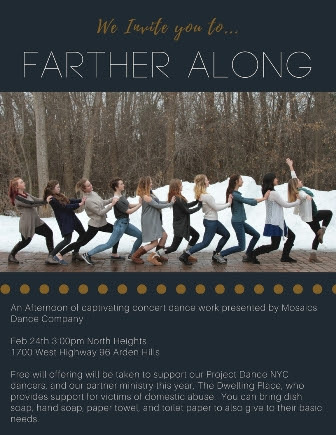 Please join us for the Mosaics Dance Company performance "Farther Along" at North Heights Lutheran Church at 3 p.m. This event is open to the public, no tickets required. This is a fundraiser and Basic Needs Drive for The Dwelling Place.